BUCS: Williams 18-49, Alstott 4-15, Simms 3-11. REDSKINS: Portis 16-53, Betts 10-25, Moss 1-11, Brunell 4-6. REDSKINS: Brunell 15-7-41-1-0, Portis 1-0-0-0-0. BUCS: Galloway 7-69, Hilliard 4-38, Pittman 3-30, Becht 3-26, Smith 3-14, Williams 3-10, Alstott 1-7, Shepherd 1-4. 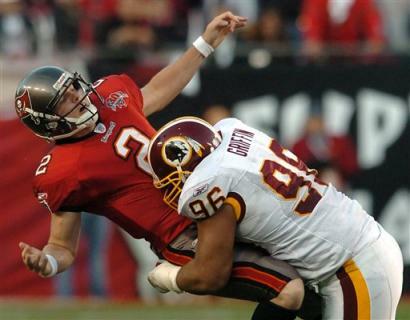 REDSKINS: Arrington 1-21, Washington 1-13. REDSKINS: Betts 2-43, Sellers 1-12. BUCS: Rice 1-11, Wyms 1-5. REDSKINS: Daniels 1-13, Stoutmire 1-9, Evans 1-8. Was that the last time we'll see the A-Train play?